The Consumer Choice Center will host six media roundtables discussing the effectiveness of the World Health Organization (WHO) in September 2018. We invite journalists, regulators, policy-makers, and civil society to join us for presentations on the WHO’s shortcomings in working towards better global public health and how the WHO actively blocks healthier technologies in the area of harm reduction. Join us at our event in Washington, D.C. on September 25th at 12:00 PM at the National Press Club, 529 14th St NW, Washington, D.C.
IARC’s flawed decision-making process harms global health: Ross Marchand, Director of Policy, Taxpayers Protection Alliance. Join RightNOW!, the Women’s Democracy Network and Independent Women's Forum for a conversation with Rt. Honorable Liz Truss, Chief Secretary of the Treasury, the United Kingdom, to discuss Business, Money & Power: The economic empowerment of women. 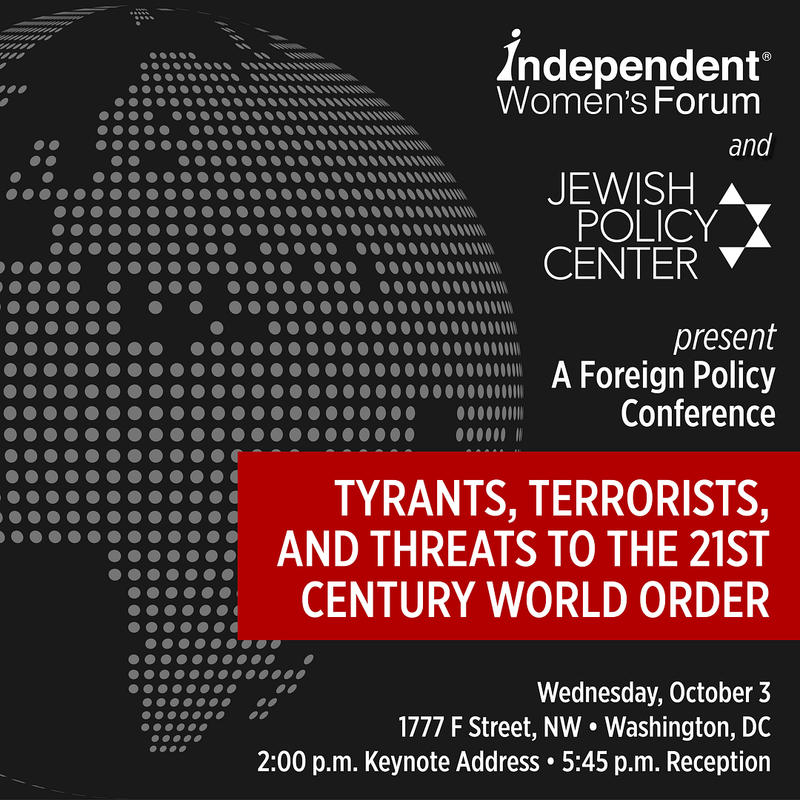 LOCATION: International Republican Institute (IRI), 1225 I (Eye) Street NW, Suite 800, Washington D.C.
An economist by background, the Right Honorable Elizabeth Truss was appointed Chief Secretary to the Treasury in June 2017 by Prime Minister Theresa May. Her role gives her responsibility for overseeing U.K. public expenditure labor market policy and welfare reform. A member of the Conservative Party, she was first elected as a Member of Parliament in 2010 and has held several important government roles, including Education Minister, Environment Secretary, and Justice Secretary and Lord Chancellor. Opioid overdose claims 91 American lives each day. What can parents and communities do to combat this crisis? 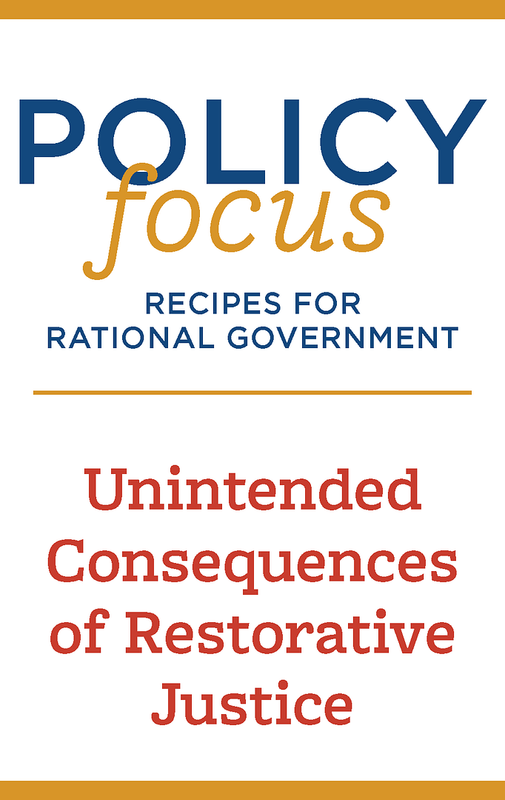 How can we prevent loved ones from abusing opioids? What are the warning signs that someone may be in danger of addiction? Join Independent Women's Forum for a breakfast discussion and hear from two leading experts in the field as we discuss ways to discourage opioid addiction and abuse. Your College Degree: Is It Worth What You Paid for It? 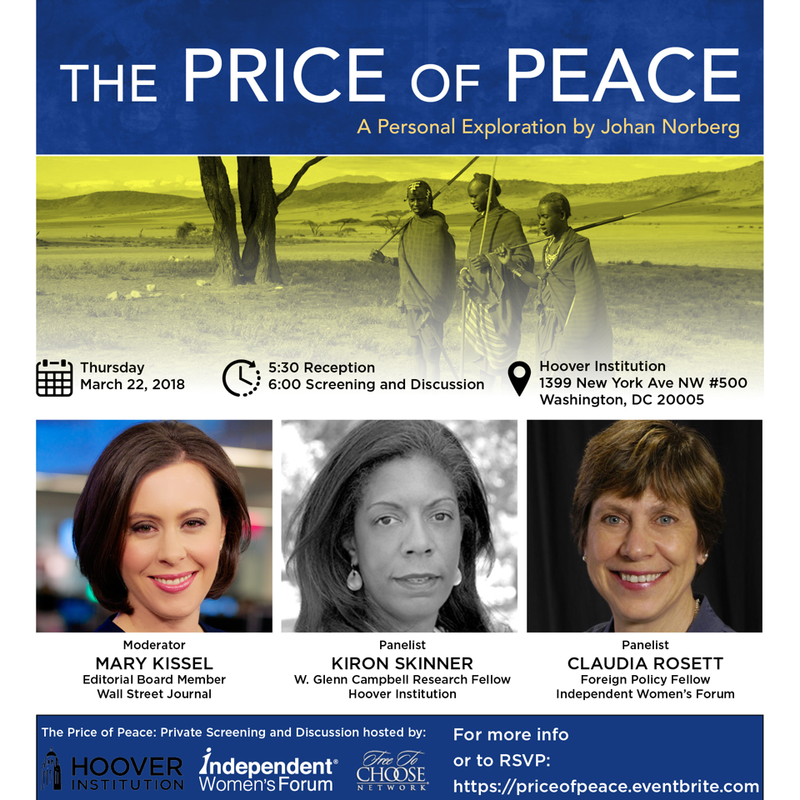 Join us for a private screening and discussion of The Price of Peace hosted by Hoover Institution, Independent Women's Forum, and Free To Choose Network on March 22, 2018 at 5:30pm ET at Hoover Institution (1399 New York Avenue, NW #500, Washington, DC 20005) feauring Wall Street Journal Editorial Board Member Mary Kissel, Independent Women's Forum Foreign Policy Fellow Claudia Rosett, and Hoover Institution W. Glenn Cambell Research Fellow Kiron Skinner. * Run for office in 2018? * Start preparing for a future run for public office? * Work or volunteer on a political campaign? * Become more politically active? Then plan to attend the first ever “Ready to Run” workshop in Washington, D.C., hosted by The Graduate School of Political Management on Saturday, March 3 from 8 a.m. to 6:30 p.m. on GW's main campus in DC. The event will be held at the Milken School of Public Health, 950 New Hampshire Avenue, NW, Washington, DC 20052. You'll learn from the top practitioners and consultants from both sides of the aisle about how to run a political campaign. And you’ll meet key officials from political parties and groups who support women candidates. This one-day bipartisan women's political leadership training program, developed at the Center for American Women & Politics at Rutgers, will help you prepare for the 2018 elections, either as a candidate or as a campaign staffer/volunteer. Tuition, which includes lunch, snacks and materials, is $150. Discount codes are available for WGR Members and students. Women’s issues are in the limelight right now, from the Women’s March to the #MeToo movement. 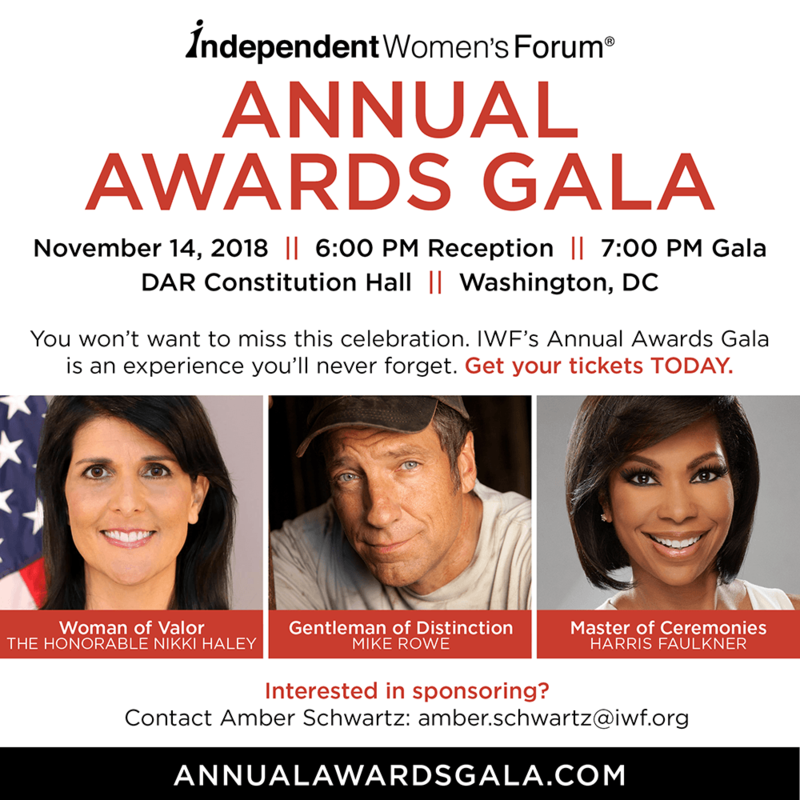 Yet many women, particularly those who identify as independent, libertarian, or conservative, have been left out of many of these efforts. In reality, women are not a special interest group, only interested in a few areas. Women care about all issues affecting our community, state, and country. So how should women on the right get involved and get their message across? Three independent women come together for a dynamic panel to discuss why all issues are women’s issues. Ingrid Jacques, columnist and deputy editorial page editor at The Detroit News, will lead the discussion. 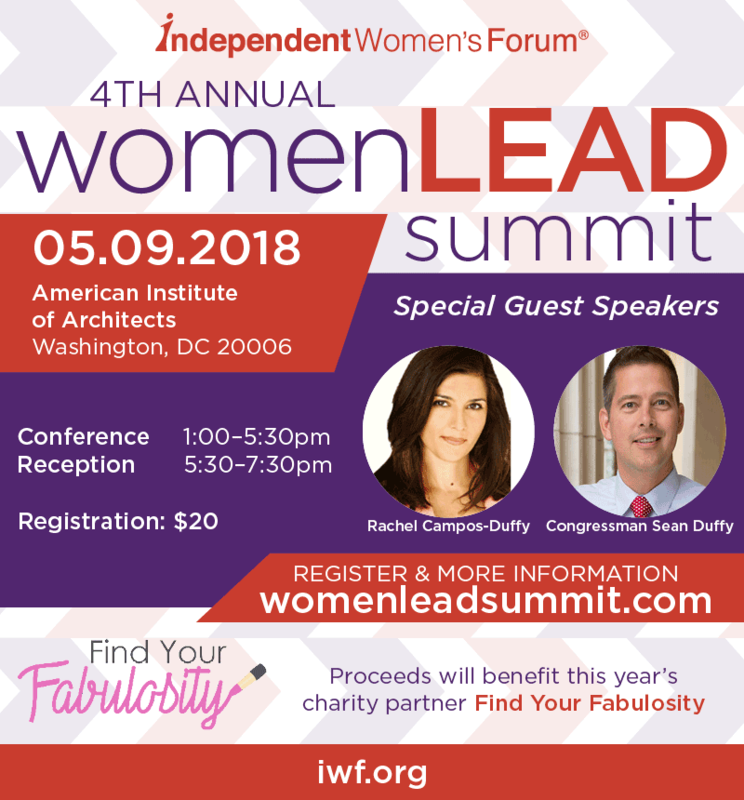 She will be joined by State Representative Lana Theis and Patrice Lee, Senior Policy Analyst at the Independent Women’s Forum, both who will give their unique insights and passion for why women of all backgrounds should engage in the policy process. This event is your chance to discuss the real issues that are effecting millennial women in our state. Join us for this discussion and evening to meet and network with other young professionals from across Michigan. As always, we will have lots of food and your first drink is on us…And men are welcome too! RSVP and invite your friends and colleagues on Facebook to the event! In many ways, technology is a woman’s best friend. 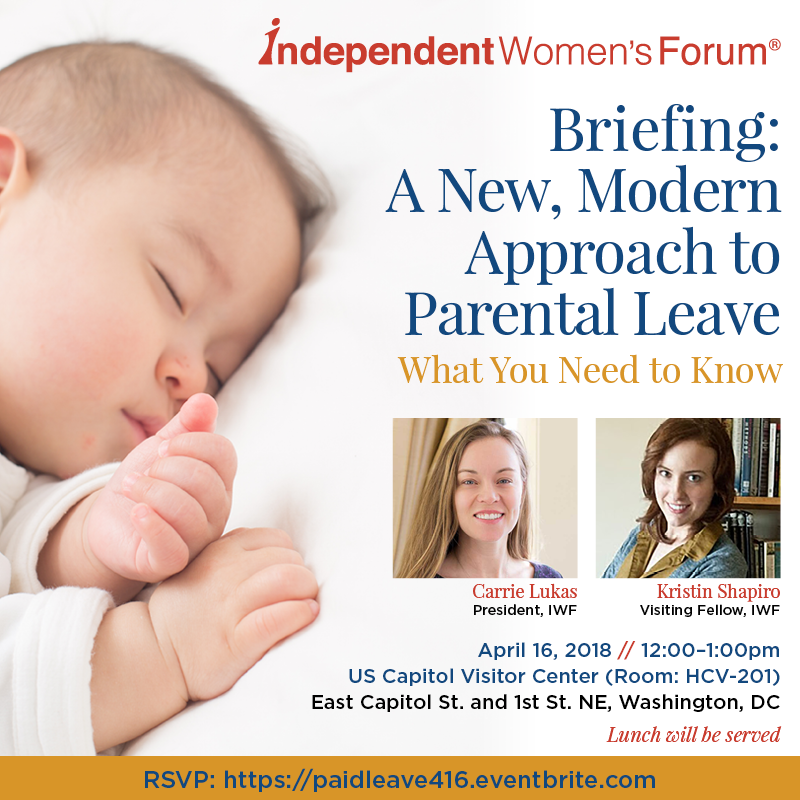 New technologies have completely altered the options for women trying to balance work and family life, facilitated the creation of millions of home-based businesses, and provided new communication pathways that help women stay in touch with loved ones, engage in politics, shop, and access educational services. Yet the expansion of the virtual world has also created new challenges and problems, such as protecting our children from inappropriate content and a decline in actual person-to-person relationships, leaving many feeling isolated. 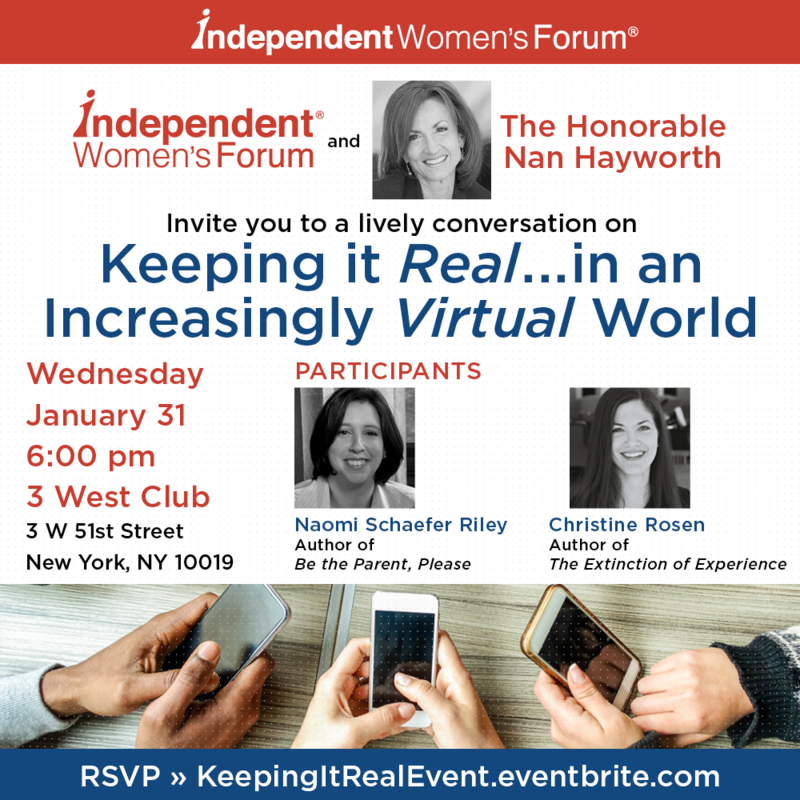 Join IWF for cocktails and light bites as we dive into the upsides and downsides of new technologies and their particular impacts on society. It promises to be a lively conversation you don't want to miss! In addition to being an IWF Senior Fellow, Ms. Riley is a former columnist for the New York Post and a former Wall Street Journaleditor and writer, as well as the author of six books, including, Be the Parent, Please: Stop Banning Seesaws and Start Banning Snapchat. Her book, Til Faith Do Us Part: How Interfaith Marriage is Transforming America (Oxford, 2013), was named an editor’s pick by the New York Times Book Review. Ms. Riley’s writings have appeared in the Wall Street Journal, the New York Times, the Boston Globe, the LA Times, and the Washington Post, among other publications. She appears regularly on FoxNews and FoxBusiness and CNBC. She has also appeared on Q&A with Brian Lamb as well as the Today Show. Christine Rosen is one of the founding editors of The New Atlantis, where she now serves as senior editor and writes about the social and cultural impact of technology, as well as bioethics and the history of genetics. She is working on her forthcoming book, The Extinction of Experience, to be published by W.W. Norton. Ms. Rosen’s past books include Preaching Eugenics: Religious Leaders and the American Eugenics Movement (Oxford Univ. Press, 2004) and My Fundamentalist Education (Public Affairs, 2005). She has co-authored several other books and was the editor of Acculturated, a web magazine dedicated to pop culture and the virtues. She also writes a monthly column about cultural issues for Commentary magazine. Ms. Rosen’s essays and reviews have appeared in publications such as The New York Times Magazine, The Wall Street Journal, The Washington Post, The New Republic, The Weekly Standard, The American Historical Review, and The New England Journal of Medicine. She holds a Ph.D. in History from Emory University. She lives with her children in Washington, D.C. In 2017, IWF is proudly celebrating its 25th Anniversary of increasing the number of women who value free-markets and personal liberty. The 2017 Annual Awards Gala will certainly be a joyous occasion and a night to remember! 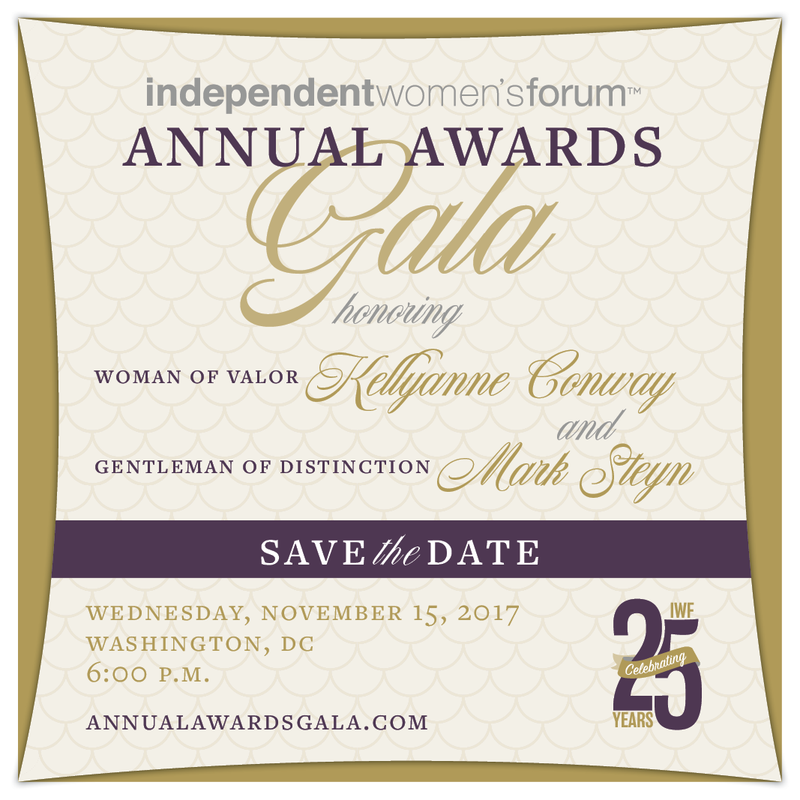 This year we are thrilled to honor Kellyanne Conway with our Barbara K. Olson Woman of Valor Award. 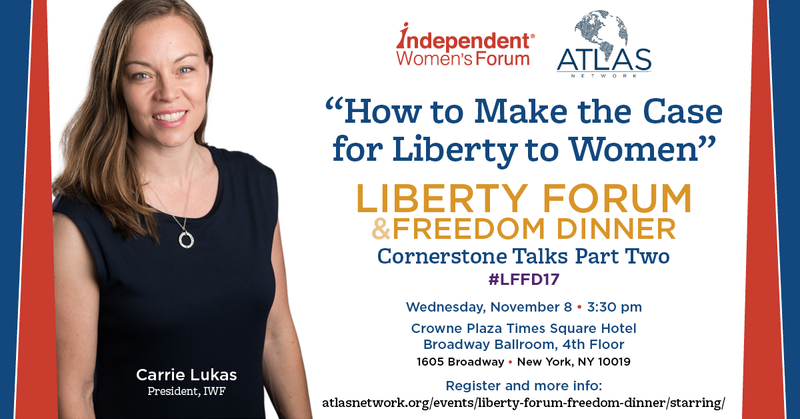 IWF President Carrie Lukas joins Atlas' Liberty Forum & Freedom Dinner for a Corner stone Talk on How to Make the Case for Liberty to Women. Join GW Network of Enlightened Women as we host panelists Karin Agness Lips, Julie Gunlock, and Emily Jashinsky discussing why Modern Feminism and the Third Wave Feminist movement do not speak for all women. Each have had their fair share of Third Wave Feminism and will share their own stories of combating it.